I have a confession to make. I have been doing less card-making lately. Our house is up for sale! Keeping the house ready at all times for house tours is a full-time job. Or at least more intense than the regular routine. But on the upside, the kids are getting used to cleaning up their stuff at the end of the day and making their beds to perfection every morning. I can live with that. 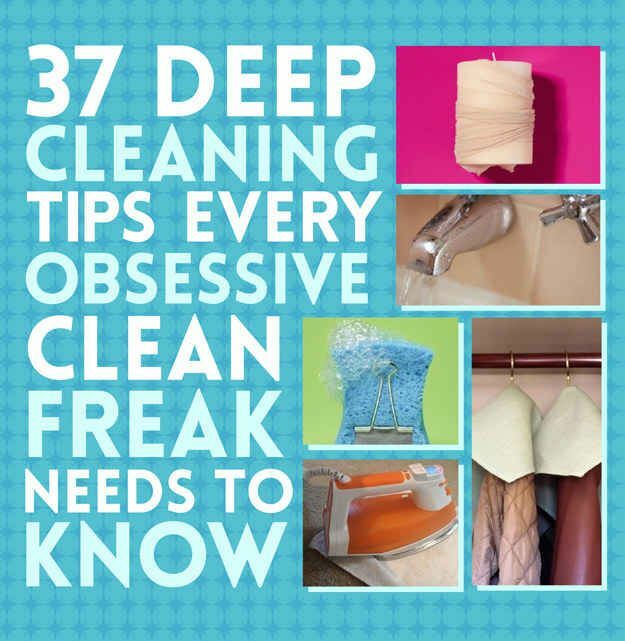 Wanna hear my best tip for dusting your house in a hurry? You know how the laundry always eats a few socks, so there are the odd ones with no match? I grab one, put it on my hand like a sock-puppet and race around, wiping down window-sills and moldings every morning. In 20 minutes, I've wiped down all 3 floors worth of everything, and then I just drop the socks back into the machine. You know, in the hopes that their mates will magically show up the next time around. This works great for kids, too! They think it's hilarious and I don't have to worry about cleaning products around Maia. I'm sorry to say that I have fallen into old habits with how I deal with stress. I'm choosing to not be bothered by the fact that my pants are feeling so tight lately. 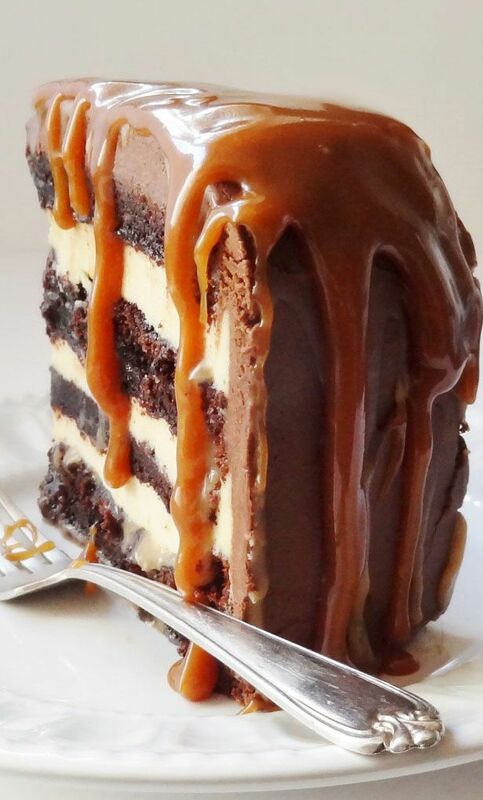 Because chocolate tastes so, so good. So does caramel and maple, FYI. See? I'm already calmer just thinking about the cupcakes I have upstairs in the fridge. 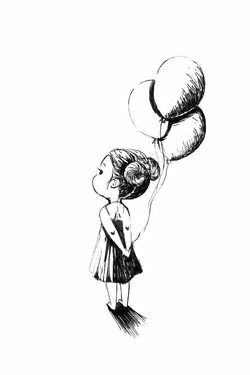 Caveat: I didn't draw that balloon-holding-girl, but she is very cute! If I thought I was wasting time on Pinterest before, whoo! I am banking some serious hours lately, dreaming of what I want to do in the new house. I am eager, but I also feel a bit of crazy coming on. Do we keep an open staircase in the dining room or close it up so I have somewhere to place a buffet? Buy new sofas or keep what we have? 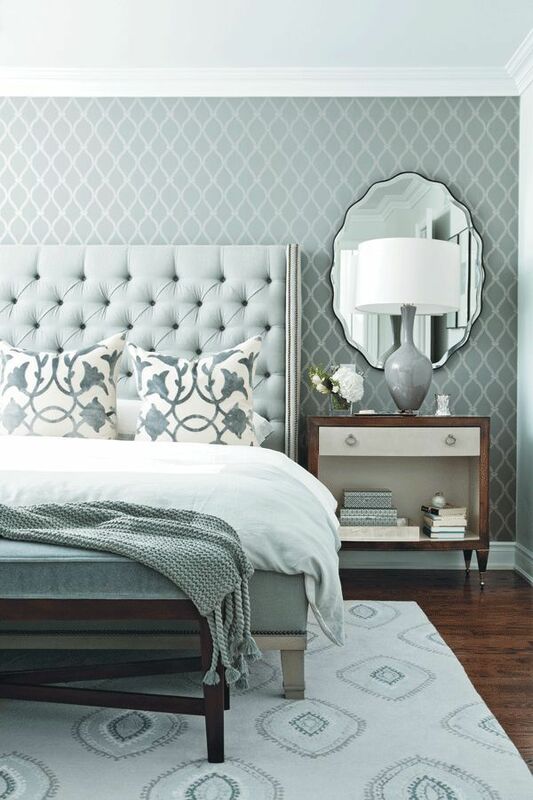 Try our hand at bedroom molding, or leave the walls plainer? Buy a new bed or build ourselves a headboard? What kind of hardwood flooring: something light, something mid-toned? eeep. Would you like to see what I'm dreaming of? Since this has always been a card-making and party decor kind of blog, I thought I should ask first. Would it turn you off to see pictures of beds, and bedrooms, and projects that I'd like to tackle, or would that be fun? It's the last day of Mama Elephant stamp highlights - I hope you've enjoyed it so far! 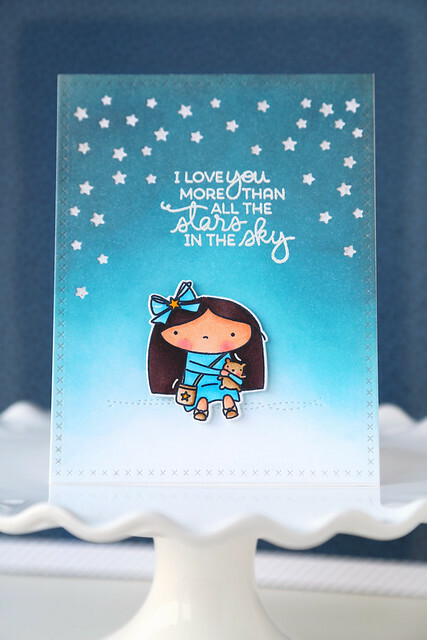 Today, we're showing off "Shooting Star." With today's card, I wanted to show you that the set is amazing, even without her. The sentiments are so sweet, and can stand up on their own. 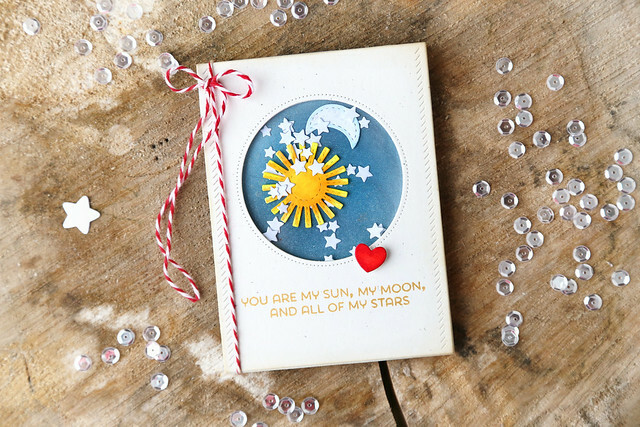 I took the sentiment quite literally, and made a shaker filled with a sun, a moon, and a whole lotta stars. ♥ for the sun and moon, the stitched sky dies. ♥ for the stars, the lots of stars die. 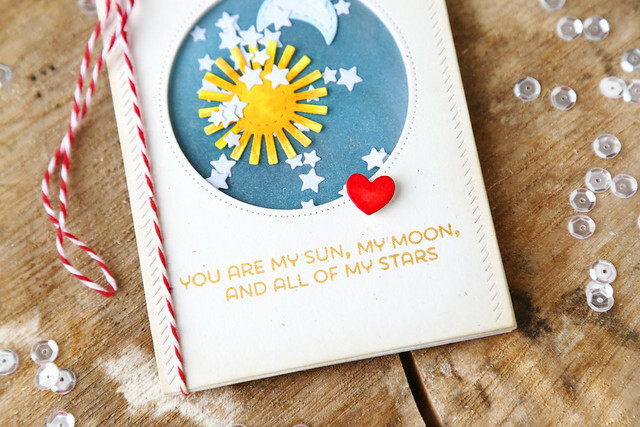 ♥ for the circle cut-out, and the base panel, the sew fancy dies. 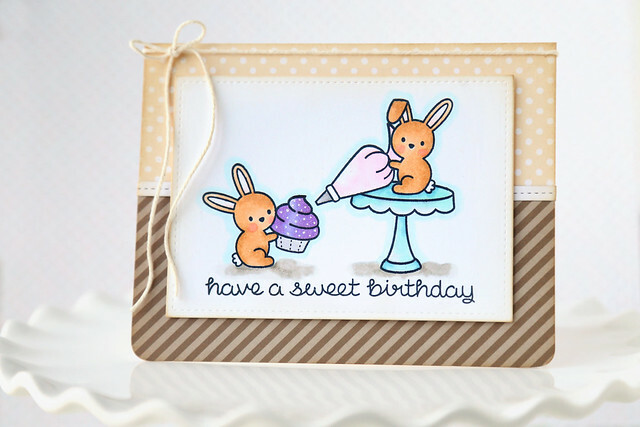 The card isn't a regular-sized card, but sometimes a more petite card is such a cute surprise. To create the shaker, I used a foam sheet with the same circle cut-out. I hate using adhesive for my shaker cards, where everything sticks to the sides and nothing is left to shake around. The sky stuff is sandwiched between the base layer and a piece of clear acetate. Which is so new you can't even see it. ha. How do you make your shaker cards? Do you enjoy making them? I'll admit that I don't. But I do enjoy how much people like receiving them. And this one would make the perfect Valentine's day card, I'm thinking. Hey there! The ME team is showing off the beautiful, handwritten set "Merci." 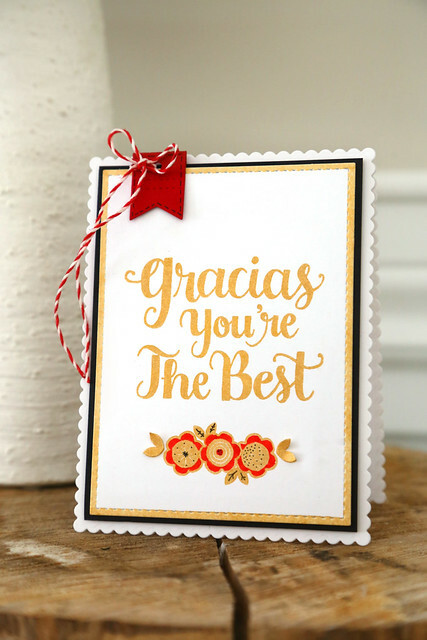 I love, love, love that there is now a huge merci beaucoup sentiment that I can use to make quick card sets for all of the french teachers here! What do you do when you know you want a gold sentiment, but are too lazy to take out the embossing powder, heat tool, embossing powder tray? You can purchase it at Simon Says Stamp - click! I used it on the sentiment, the flowers, and I even took a little sponge and rubbed it around the outside of my focal panel. I stamped the middle flower, and masked it to be able to stamp one on either side. I wasn't sure how the gold ink would react to a copic marker, but I was very careful and it didn't bleed. I added some flower doodling by way of a black copic multiliner pen, to add some pop and to echo the black cardstock layer. Hi there! 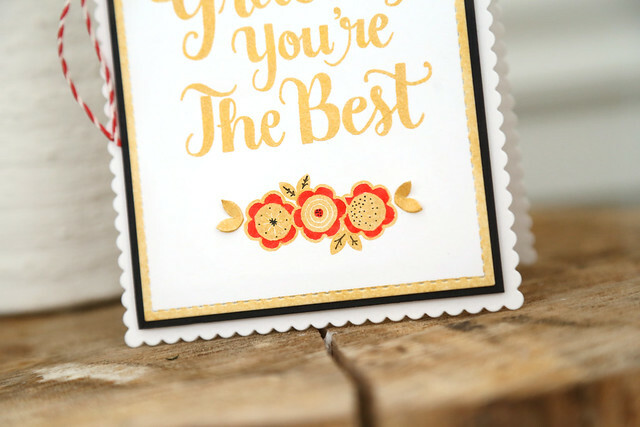 The Mama Elephant design team is showing off "Surprise Sentiments" today - a super fun sentiment set, perfect for gift-giving. I varied only the tiny hero, and the accent color. Other than that, they came together easily since they are both the same. I started out with the sunburst from "My Sunshine" - because it's a natural compliment to the tiny heroes - and grounded the panel with a few layers of cityscape. 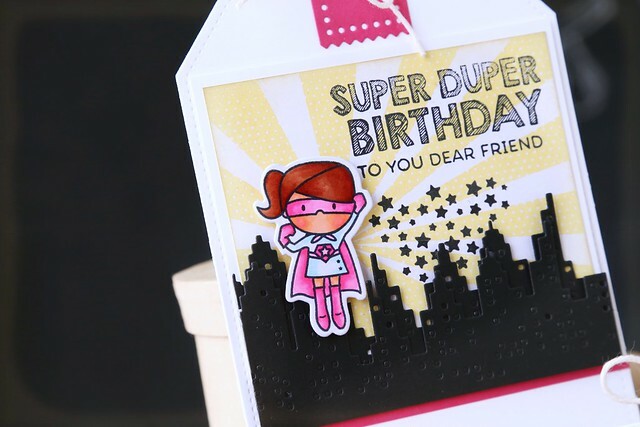 The tiny heroes are flying above the rooftops, for justice and birthdays. 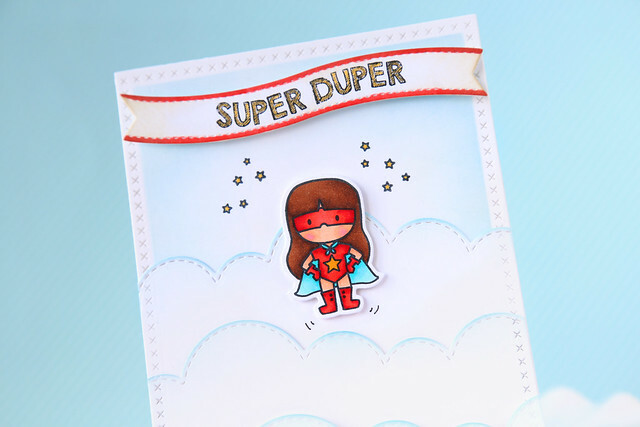 The "super duper" is from the Tiny Heroes set, and the "birthday" is from Surprise Sentiments. Same font, so why not mix and match? It's a perfect way to get more out of your new stamps. I stamped the "from" and "to" from "Surprise Sentiments" at the bottom of each tag. Thomas already used the boy version this past weekend, and wrote a note on the back to his friend Aidan. 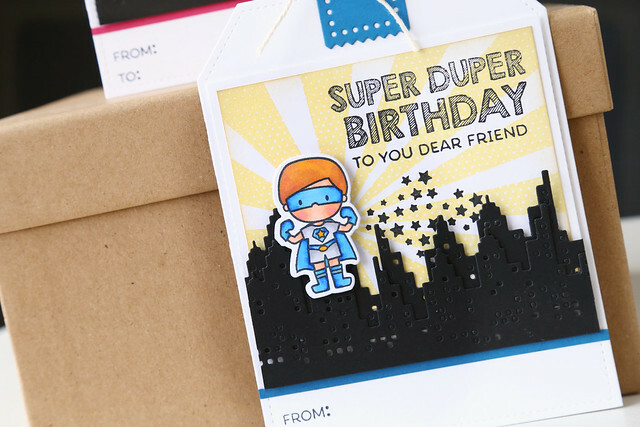 I love the idea of a giant tag instead of a folding card! I hope you like what I've created! Click over to the ME blog to see what the rest of the design team made for today. Hi! 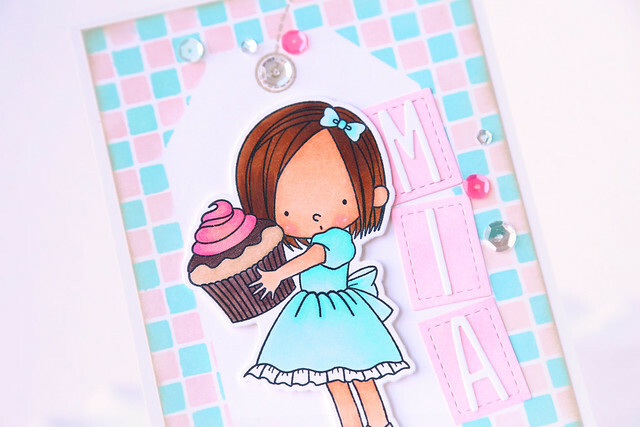 Welcome to the first day of Mama Elephant's new release stamp highlights! 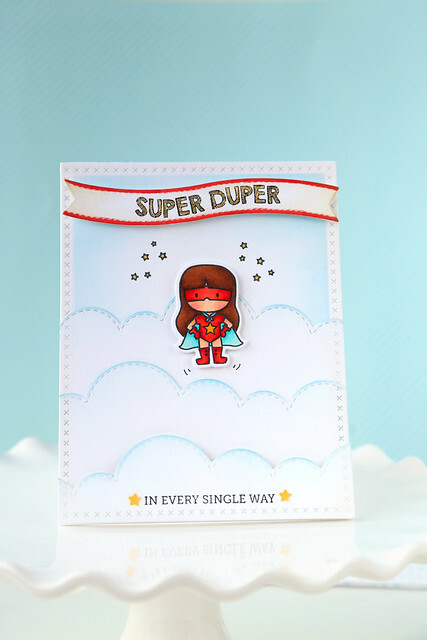 Today features the cutest set of the bunch, Tiny Heroes. My little hero has flown up to the clouds! I used the cloud border to create a skyscape, and added little motion lines around the hero. The sentiment was broken up into 2 parts, so that I could highlight each line separately. Instead of the solid star cluster found in this set, I opted for the outlined stars found in Shooting Star. I love that Mama Elephant themed their products this month, so that stuff from one set works so well with another of the new releases. I hope you like it! There's more from the design team on the ME blog today - click! Mama Elephant's newest release is live and already for sale in the shop! And to celebrate, they are giving away one of each of the new stamp sets. Winners will be chosen at random from the comments left on all of the stampeding blogs. Read all the way to the end of the post to find out ways you can boost your chances of winning. I used the new set, Shooting Star. It works so well with the previously-released Starburst cover creative cut, don't you think? And isn't the little girl holding her bear so darling? I inked up an ombre sky (using Mama Elephant inks in 3 shades of blue,) and colored her dress blue as well, to create a more monochromatic overall look. 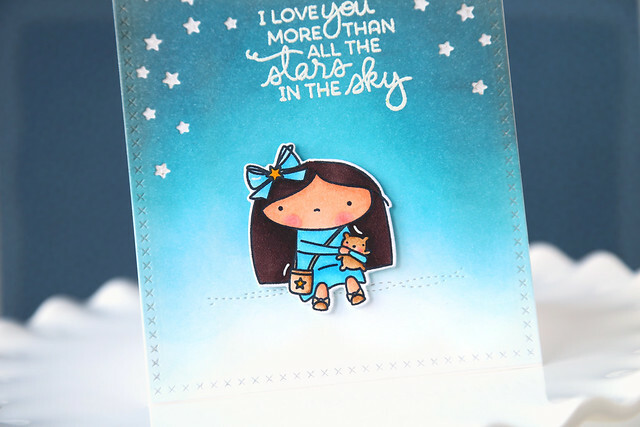 She's resting on a stitched line die, found in the new Sew Fancy creative cut set. It grounded the image, and gave her a place to sit, without adding any extra bulk. I love it, and will definitely be using this delicate die a ton! what's black and white, with red spots? The Lawn Fawn design team is taking turns being featured on their blog all this week, and I'm up first. 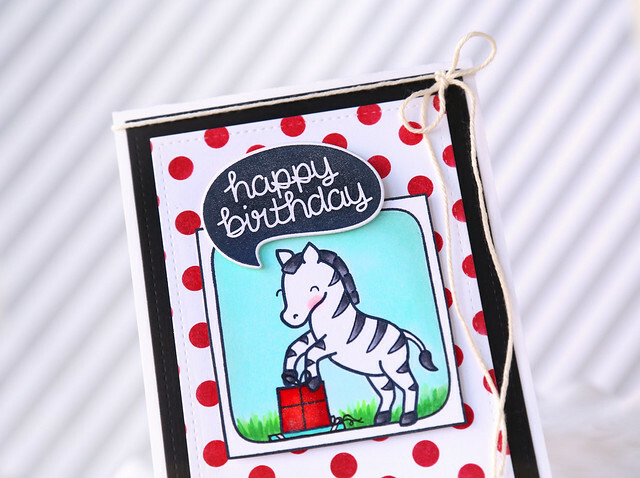 I created a birthday card using the adorable zebra from Critters On The Savanna. The instagram-type frame in #awesome was perfect for highlighting my stamped scene. I stamped the zebra, masked him, stamped the present (from Year Two) but then found that the present wasn't tall enough. I grabbed a copic pen and drew in a thinner gift box to fill in the space below. I created the grass and sky background with copic markers. And nothing complicated. I like my cutesy cartoon images to be colored simply, and their backgrounds too. ha. Also: I've decided that the zebra's pose is the way to go when attending a party. I shall henceforth arrive at a party, place the gift on the ground and proceed with a captain morgan pose over the gift. Pretty Pink Posh birthday hop! It's a 3 day hop, and today is day 3. 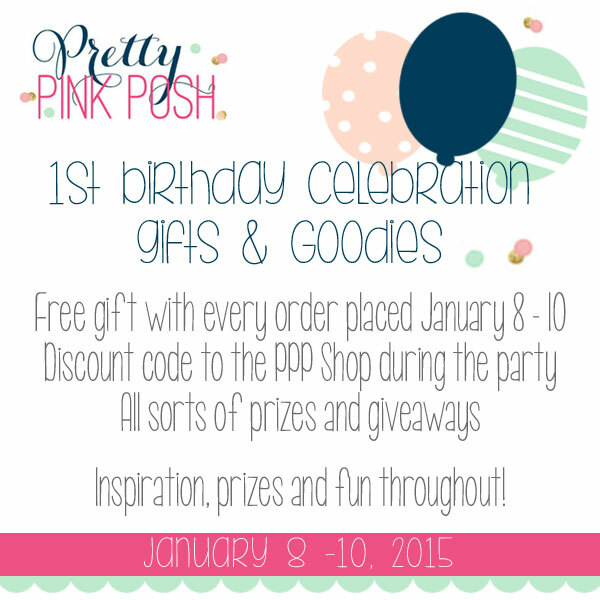 If you've missed anything so far, click over to the Pretty Pink Posh blog. There have been a few projects that have made me go "wow!" already. Did you see *this* one, by Laura Bassen? Amazing. Can you spot all of the PPP stuff I used on this card? I had to combine them with some new MFT goodies too. I first die-cut a tag out of masking paper and laid it down on my card-front. I used a checkerboard stencil to create the bubble-gum pink and blue background. When I pulled away the masking paper, I was left with plenty of white space to place my focal images. The Birdie Brown image is so cute, isn't it? Torico is such an amazing illustrator! I die-cut the tiny stitched rectangles, and used them to back the letters spelling out Mia's name. The glitter on the cucpake icing and the sequins add some birthday-girl-appropriate sparkle. I used a mix of different sequin sizes: the tiny clear ones, and the sweetheart mix. You can't have a birthday celebration without presents! There are prizes to be won, so comment along each stop of the blog hop. As a bonus, Paulina is offering a special discount code on her blog. 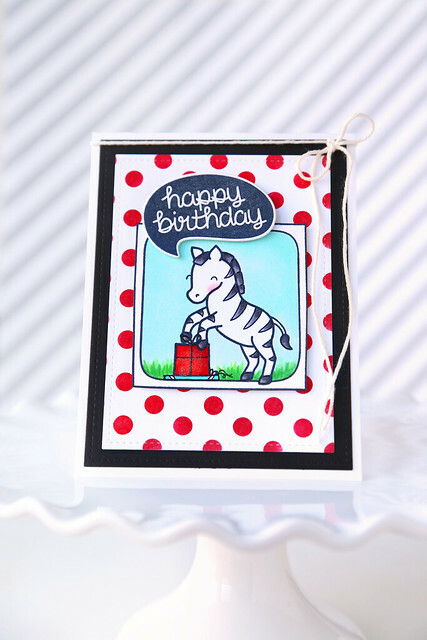 While Lawn Fawn is at CHA, they're showing off all of the new stamps and dies and papers and inks (!) that they've created for the event. Everything will be on sale by mid-february, but you get to see it all this week! If you've missed anything, head over to their blog and scroll back. It's all amazing stuff! 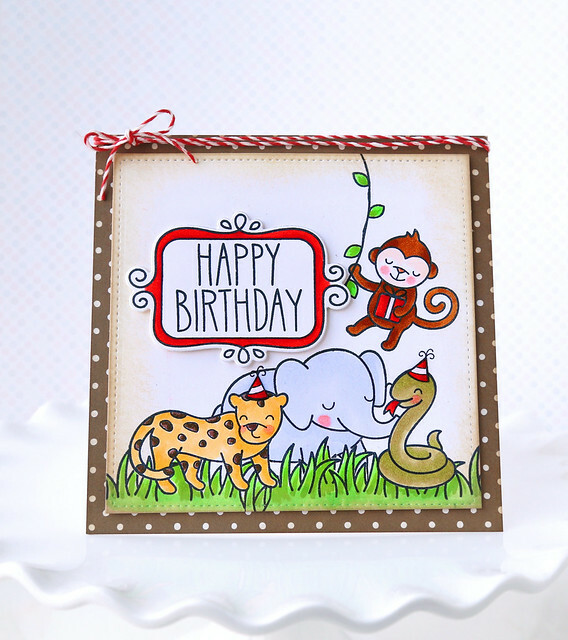 I have a birthday card to show off using the new set, Critters in the Jungle. I also highlighted the sentiment by popping it into a flirty frame. 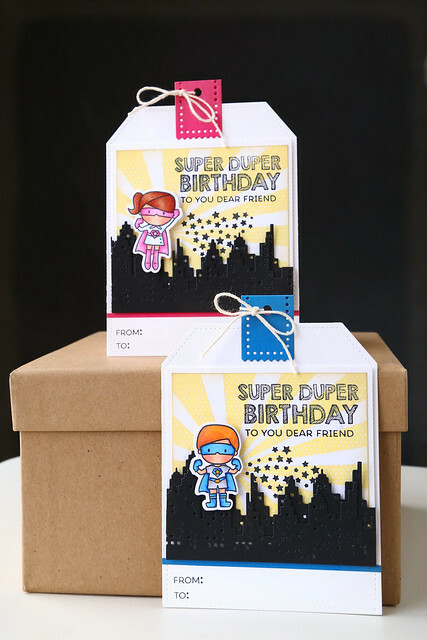 I am seriously missing birthday cards in my stash, (mostly because my sisters and mom came shopping at my house) so you'll be seeing a lot more "happy birthdays" on the blog for a bit. Who doesn't love a party animal? Birthday hats and a vine-swinging-gift-holding-monkey. It's all good. In the almost 3 years that I've been blogging, I don't remember ever having taken as long of a break as I did over these past few weeks. But with good reason: if you follow me on instagram (mom2sofia), you'll have seen that our home is up for sale, and we'll be *fingers crossed if this house sells* moving to our newly-purchased house in the spring. Sooo, I'm excited, nervous, and feeling completely rusty at this whole blogging thing. gah. Lawn Fawn is heading to CHA (the Craft and Hobby Association Trade Show) this week with 13 new stamp sets and 25 new dies - whee! They are showing off some of the new stuff today on their blog. I'm showing off 2 cards I made, with the new sets: Baked with love, and Gleeful gardens. 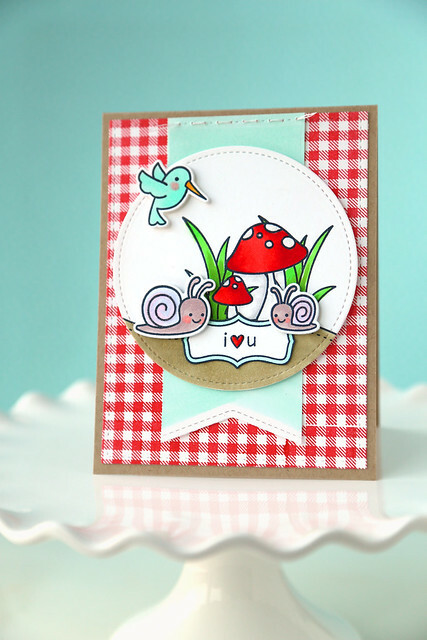 I am in love with the cute critters found in this set, and the giant mushrooms. I fit them all onto a NEW Stitched circle die, and popped the sentiment (not from Gleeful gardens, but from another new set) into a NEW Flirty frames image. And, what's more garden than gingham? I'm so happy lawn fawn is coming out with a gingham background set - it's so pretty! Baked with Love is my absolute favorite set of the entire new release. I love to bake, I love to eat, and I love to gift baked goods. So I needed this set. I wasn't ready to put away the winter bunnies just yet. I had them doing all of the cupcake decorating. slave labor. and I paid them exclusively in cupcakes. I hope you like both cards! Don't forget to check out the Lawn Fawn blog all this week for sneak peeks at everything new!